As Lavette told Rolling Stone, she wasn't much of a Dylan fan and the idea to make the album wasn't hers. Her friend, the photographer Carol Friedman, pitched it to her in 2016 and then sold the project to Verve Records, with drummer Steve Jordan as producer. (Friedman is credited as executive producer.) Regardless of how the album came about, it represents a milestone in the checkered career of the 72-year-old soul singer who made her first recordings in 1962, when she was all of 16. 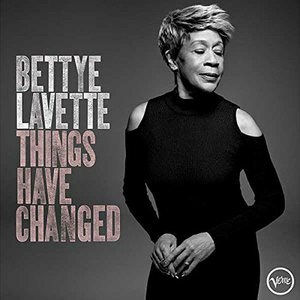 Things Have Changed is Lavette's first album devoted entirely to one songwriter and her first major label outing in 32 years. It shows Lavette at the top of her game, as a superb reader of lyrics and a bold stylist unafraid to re-work some well-known tunes and some obscure but worthy ones that needed her touch to come alive fully. Lavette's husband, Kevin Wiley, helped her select the songs, which cover some five decades of Dylan's career, from the early '60s ("It Ain't Me, Babe", "The Times They Are a-Changin'", "Mama, You Been on My Mind") to the 2000s (the title track and "Ain't Talkin'"). From Dylan's Jew-for-Jesus phase she picked "Do Right to Me, Baby (Do Unto Others)"; "Going, Going, Gone", from 1974's Planet Waves; "Political World" and "What Was it You Wanted" from 1989's Oh Mercy; and three left-field choices, "Don't Fall Apart on Me Tonight" from Infidels (1983) and "Emotionally Yours" and "Seeing the Real You at Last", from the critically derided Empire Burlesque (1985). As that list demonstrates, Lavette favors the personal songs over what Dylan himself called the "finger-pointing" material, the intimate over the declamatory, and the plain-spoken over the surreal. Lavette and Jordan have radically reworked the songs, but thankfully not in the way Dylan too often does in his shows. She takes liberties with the melodies and the lyrics, too — on "Ain't Talkin'" she re-arranges some verses and deletes others. But her melodic and harmonic changes don't disguise the songs, and the lyrics are always intelligible. The genius of her approach is evident from the album's first track, the title song. Although "Things Have Changed", written for the film Wonder Boys, won an Academy Award for Best Original Song, it always seemed like middling Dylan. Lavette's version is like hearing the song for the first time. She draws out all its nuances, the humor, irony, and desperation. When she sings "I hurt easy, I just don't show it / You can hurt someone and not even know it", the bluesy ache in her voice gives full emotional weight to lines Dylan tosses off. "It Ain't Me, Babe" loses its callowness to become a sorrowful apology to a lover whose expectations she can never satisfy and can only disappoint. "Mama You Been on My Mind", which Dylan wrote in 1964 after his breakup with Suze Rotolo, becomes a hymn-like tribute to Lavette's mother. On "Don't Fall Apart on Me Tonight" Lavette does much more than make a case for this deep catalog number— she turns it into a gripping lover's plea of searing emotion, her raw "Please! Please!" raising the spirit of James Brown. But she makes you laugh, too, with her re-write of the lyrics. Dylan: "Or do you remember St. James Street / Where you blew Jackie P's mind? / You were so fine / Clark Gable would have fell at your feet / And laid his life on the line." Lavette: "Do you remember on 14th street / Where you blew Betty Joe's mind? / He was so fine / Tina Turner would've fell at your feet / And left Ike hanging on the line." She does something similar on "Seeing the Real You at Last", tempering Dylan's anger and spite with surprise and satisfaction at having discovered a lover's true nature. Jordan, a versatile drummer adept in many styles, played with Stevie Wonder as a teenager; he went on to the Saturday Night Live and Late Night with David Letterman bands, the Blues Brothers, the John Mayer Trio, Keith Richards' X-Pensive Winos, and the band Richards put together for the 1987 Chuck Berry concert film "Hail! Hail Rock 'n' Roll!". For Things Have Changed, Jordan recruited former Dylan guitarist Larry Campbell, keyboardist Leon Pendarvis, and bassist Pino Palladino, with Richards and Trombone Shorty making cameo appearances on "Political World" and "What Was It You Wanted?". Under Jordan's direction, they sound like an actual band rather than hired studio hands, a supple and razor-sharp unit that builds a foundation from which Lavette can soar. Dylan fans like to say that no one does Dylan like Dylan. That's true in its most literal sense. But he's had some fine interpreters, and, though it's rarely acknowledged, many of the best have been women: Joan Osborne and her Songs of Bob Dylan from 2017; Bonnie Raitt ("Million Miles", "Standing in the Doorway Crying"); Mavis Staples ("Gotta Serve Somebody"); Abbey Lincoln ("Mister Tambourine Man"); Nina Simone ("Just Like a Woman", "I Shall be Released"), and Joan Baez (too many to list). With Things Have Changed, Bettye Lavette hasn't just joined the ranks of first-rate Dylan interpreters, female and male — she's taken her place as leader of the pack.